Alcatel OneTouch Pixi Eclipse is a smartphone that comes running Android 4.4.4 KitKat. It has a 4-inch display fully touchscreen, 1.1GHz quad-core processor, 4GB internal storage, 512MB RAM, and a 1400mAh battery. It’s a modest smartphone if you are just starting out on Android. More importantly, it is highly affordable; it is priced at less than $50, and you may get it for free, in that, you only pay for the wireless plans – we will discuss the plans at a later section of the review. 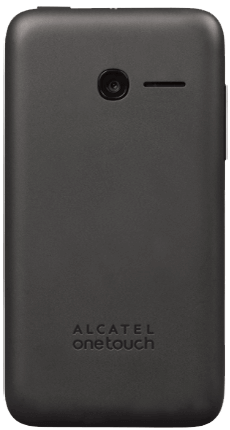 Alcatel OneTouch Pixi Eclipse is available from Net 10 Wireless, Straight Talk Wireless, Total Wireless, and TracFone Wireless. We are currently using the version from Straight Talk Wireless. Opening the box, you will find the Pixi Eclipse gadget, back cover, battery, wall charger, service guide, warranty information, general user manual, and a quick start guide. This being a lower end gadget, the Alcatel OneTouch Pixi Eclipse comes with a normal design to it. It is made of a plastic unibody and is available in black color. The back cover is matte black, hosting the rear camera lens and the handsfree speaker. The back cover can also come off to reveal the battery compartment and the slots for the SIM card and microSD card. We have the volume rockers sitting on the left edge, while the top edge hosts the headset and power/lock button. There’s no button whatsoever on the right edge, and the micro-USB/charging connector is situated on the bottom edge. The front panel has your display. It has the physical navigation keys on the bottom bezel; back key to the left, home key in the middle, and the menu key to the right. The top bezel has the earpiece, proximity sensor and the noise cancellation mic. That sums up our tour around the hardware of the Alcatel OneTouch Pixi Eclipse. The Alcatel OneTouch Pixi Eclipse has a basic 4-inch TFT capacitive touchscreen. It has a resolution of 800 x 480 pixels which we found to function well for basic functions. It is a multi-touch screen, meaning you can pinch to zoom in or out, you can as well control games with two fingers. It can comfortably play YouTube videos with a maximum resolution of 480 pixels. We find this acceptable for a phone we didn’t spend a dime on. It’s quite bright while indoors, showing clear photos, videos, and making overall operations easier. The Alcatel OneTouch Pixi Eclipse ships with a passable 2MP rear camera which is usually the most you can get on lower end gadgets. It is perfect for capturing your favorite moments. A unique feature included is the 4x digital zoom; this feature makes distant objects appear closer. The camera has some modes such as panorama, sports, filter, night, timer. It works fine with the default settings; however, you can switch to manual mode where you can adjust the white balance, focus distance, and more. Being a 2MP camera, it can record some modest videos for sharing on social media. The Alcatel OneTouch Pixi Eclipse packs a 1400mAh battery. This is rated to give up to 7 hours of talk time and up to 9 days of standby time. For a phone with a 4-inch display, and a processor that is not power hungry, you are sure to go through a normal workday on a single charge. Since the battery is also removable, you are free to carry a fully charged spare battery which you can swap with the empty battery. It is nice since most recent phones are coming with non-removable batteries, hence no option of swapping out the battery. As expected from a device at this price bracket, the internal storage is quite limited. It has an internal storage of 4GB. This is a quite limited onboard storage. Luckily enough, the Alcatel OneTouch Pixi Eclipse has a microSD slot that supports external memory expansion up to 32GB. After adding the microSD card, we had more space to add music files and install more games. The Alcatel OneTouch Pixi Eclipse has acceptable performance. It has a decent processor which has four cores clocked at 1.1GHz. A quad-core processor makes it possible to multitask without freezing the phone. The processor is paired with 512MB of RAM to provide a runtime environment for your tasks. The phone comes running Android 4.4.4 KitKat. Although this is a later version of Android, it is quite light and doesn’t put much strain on the processor. This helps avoid cases of application not responding or the phone freezing. It is nice to have 4G LTE on a lower end gadget; this means you will enjoy high internet speeds and a great video streaming experience. The device is Wi-Fi enabled, hence you can connect to Wi-Fi hotspots available and enjoy free browsing. It has Bluetooth for quick sharing of small files between nearby devices. If you enjoy navigating on Google maps, you will like the GPS chip embedded in the phone that pin-points your exact location to ensure you are following the right direction. It has FM radio for tuning into radio stations available in your area without requiring the use of internet. Call quality is good. We had our test on the Straight Talk Wireless networks and we didn’t experience any call droppings. The phone is also supported by TracFone Wireless, Total Wireless, and Net 10 Wireless which offer affordable monthly data, and unlimited calling and texting with no contract. We have listed these pricing plans in a section below. 4G LTE / Wi-Fi / GSM / CDMA. Display: 4-inch; 800 x 480 pixels resolution. Display Type: TFT Capacitive touchscreen. Internal Storage: 4GB; 2GB microSD included, supports external memory expansion up to 32GB. Camera: 2MP back; 4x digital zoom. Battery: 1400mAh; talk time up to 7 hours, standby time 9 days. Hearing Aid Compatible (HAC) Rating: M3/T4.